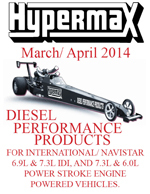 Cowl Air Induction System from Hypermax. The cowl air induction system provides cooler turbocharger inlet air temperature, lower air cleaner restriction, and lowers exhaust manifold temperatures. Application: 1994 F-Series pickup with the 7.3L Ford turbocharged diesel only. This kit contains the longer hose necessary for clearing the factory Ford turbocharger.